A long-term scientific study to monitor trends in the biodiversity and structure of ecosystems of tropical forests is making use of a network of Campbell Scientific field stations in Central America. Taking advantage of standardized protocols, each station will obtain data using the same methods, making the results consistent and comparable. The project is sponsored by the University of Missouri, St. Louis, in cooperation with the Organization for Tropical Studies (OTS) in Costa Rica. The principal researcher is Dr. David B. Clark, and the project coordinator for the OTS is Johanna Hurtado of Costa Rica National University. 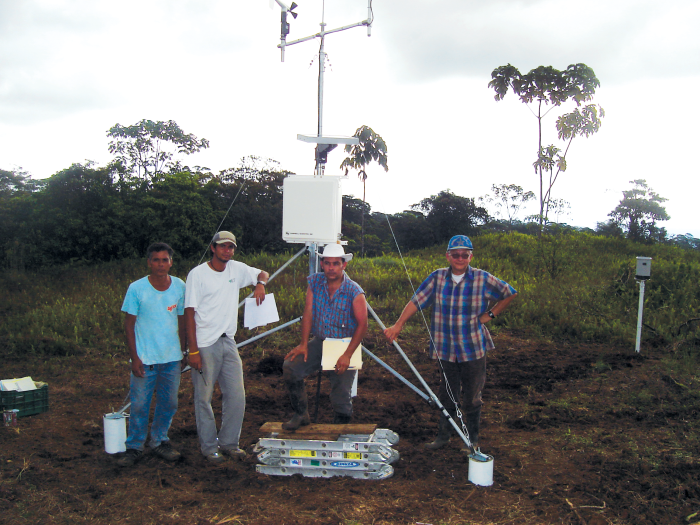 Meteorological data is collected from a network of Campbell Scientific’s automatic weather stations. The stations measure the following parameters: rain, wind, solar radiation, air temperature and relative humidity, and soil moisture and temperature. The plot of land for this study is located in La Selva Biological Station (1,500 ha) that the OTS administers in Costa Rica, and in the Braulio Carrillo National Park (47,000 ha) on the slopes of Barva Volcano. Side by side, La Selva and the park spread out laterally on a gentle grade for close to 3,000 m of altitude of protected forest, which is a characteristic almost unique to Central America. The design includes establishing a grid of 1-km2 plots of land throughout the sector. Each of these plots of land is called an AMI (area of integrated monitoring) and, at this time, there are four such areas. In order to select an AMI several factors are considered: present types of forest in that area, presence of permanent bodies of water and areas of seasonal flooding, potential sources of disturbance and of effects of edge no closer than 500 m, and accessibility within an hour hiking distance from the station or closer means of entry. The measured variables were selected so that they would give information on a variety of levels, range of plant sizes, physiological adaptations, and strata inside the tropical forest. Moreover, they were selected to learn what we should be able to study in various types of forest on all continents. For this reason the researchers selected, as indicators of biodiversity at the local level, environmental and biological variables that include vegetation, vertebrates, and invertebrates. Finally, the philosophy of the project is to merge science and conservation through the accomplishment of complete zoological and botanical inventories, adherence to rigorous field procedures, use of tools for data analysis, and investment in education and student training from technician to doctoral levels. At present 90 percent of the work is done by local human resources of Costa Rica. The technical team in La Selva is made up of people from the area with previous experience or that have been trained through the project. See www.teamnetwork.org for more information. Campbell Scientific Centro Caribe S.A.